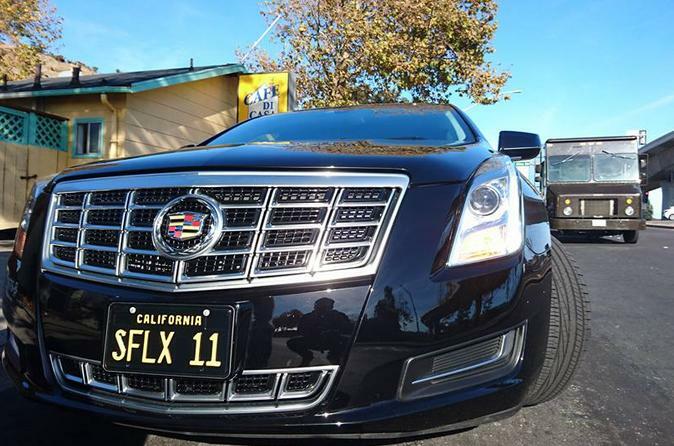 Private luxury transfer in from San Francisco to or from SFO airport and city of San Francisco. Professional uniformed black and white suit chauffeur to take you in safety and security to your destination. Please be sure to select the appropriate option for your group size. Sedans will accommodate up to 3 passengers, SUV will accommodate up to 6 passengers and our Mercedes Sprinter Vans will accommodate up to 14 passengers. Professional and trained chauffeurs will pick up your party in a late model black on black Lincoln Town Car, Cadillac XTS or BMW sedan in style. They will provide safe and speedy transportation from SFO Airport to anywhere within the city of San Francisco. You will have several options as well as vehicle upgrades, please see our SUV transfer option for parties of 4-6 passengers, or our Mercedes Sprinter options for parties of up to 14 passengers. Arrive in style. All fees are included with the exception of any parking or gratuity which you may provide to the driver. All prices are valid from SFO to San Francisco City only.